I have a confession--Quinoa and I have been at odds over the last few years. I try and try to love this seed/grain and for some reason it just wasn't happening. Until this week. I decided to give it a try for a recipe for Sunday Supper coming out this Sunday and ended up with two recipes that I thought were equally as good. I experimented with different fruit and salad dressing but I kept going back for more. One spoon-bite-at-a-time. All I could think of was MORE! Why the change of heart? I think it has to do with cleaning the quinoa. I know that I washed it before but I don't think I did it nearly enough times and with the care I gave it this last time. Quinoa is considered a seed although some will call it a grain. It develops a bitter flavor when processed and the need for a good wash is a must. I actually let the seed sit in a water bath for a few minutes, rinsed, sit again, rinsed again--repeat 2 more times. YES--I washed it 4 times. I noticed that with each wash the water was cleaner and a bit clearer. I had one person in my house that did not like the salads. Drake, my 17 year old, could not wrap his brain or taste buds around the texture or flavor. I do think that it is more about texture than flavor with this teeny tiny seed. The only thing my daughter and I could compare it to is the roe served on sushi. You get a bit of a "pop" with each bite. The salad takes but a few minutes to toss together once the quinoa is cooked. The dressing should be tossed with the salad right before you serve it. I am using raspberries because they were a great tart component to the dish but they do have a tendency to break down as you mix and stir. 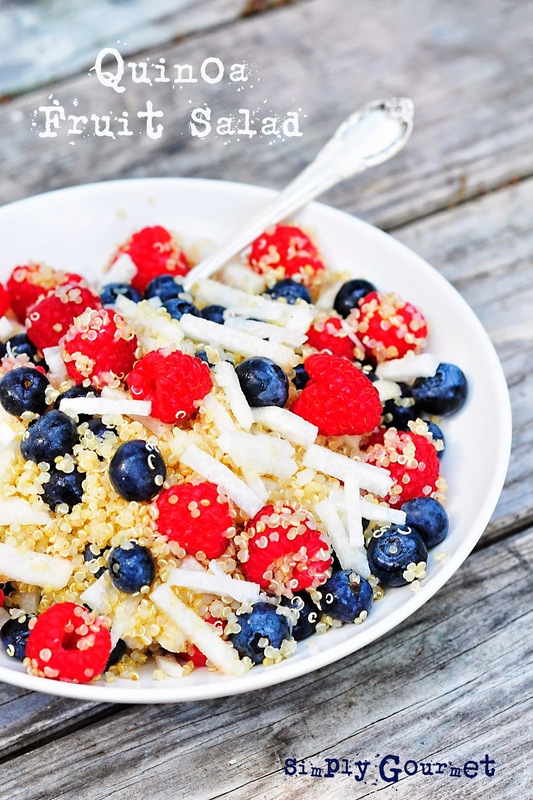 I would suggest that the quinoa be placed in the bottom of your bowl, add the berries and jicama and then toss with dressing right before, as mentioned earlier. I added a lime slice to each serving because lime goes really well with quinoa and it was a great balance of sweet and tart. Jicama is firm and has a mild flavor. It is wonderful to use because it can offer a bit of a crunch to the salad. If you cannot find jicama then try and substitute an apple but the flavor of the salad will be a bit different. NOTE: Dressings are a condiment that depends on personal taste. This is how we like it but don't be afraid to add your own ingredients or leave something out you don't like. I always suggest that you use the smallest portion of required ingredient, taste and then add more. ENJOY! 1. Prepare quinoa by following directions on the back of packaging. Let cool slightly. 2. Wash and prepare the fruit. Jicama should be peeled first. Cut in half and cut in narrow slices. Stack the slices and cut into little match sticks. 3. Make dressing in a small bowl. Combine all of the ingredients and whisk until well blended. This dressing is not heavy on the salad. If you want more dressing please make another batch. 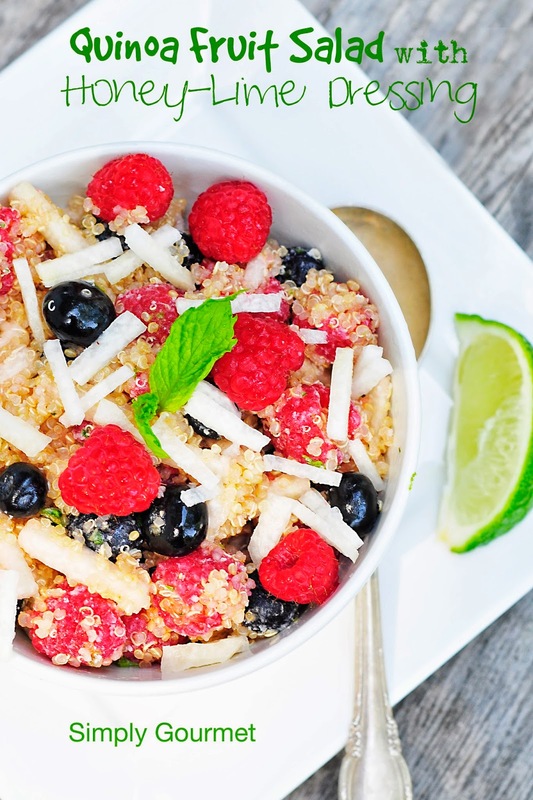 If you find the dressing to be too thick on the salad, toss in a bit more fruit and quinoa. 4. 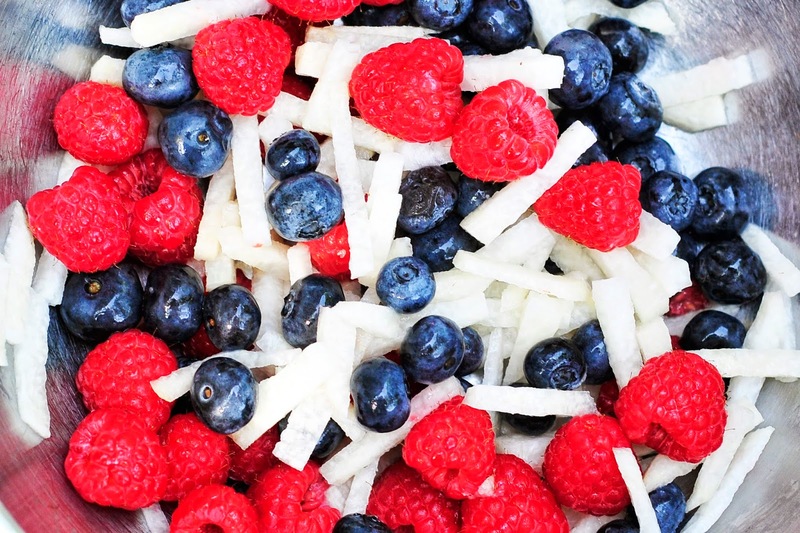 Layer salad in a medium bowl with quinoa on the bottom, then fruit. Add dressing right before you serve the salad and toss. Store leftovers in refrigerator.